The first half of my run was somewhat uneventful. I was fighting off a slight headache and my neck was a little stiff. My energy was not as peppy, due to having a couple of nights out this week. I just kept thinking that after a while everything would fall into place. I soon realized that I had forgotten one thing on my pre-run checklist; anti chafing cream. Last thing I wanted was to get all chapped up on this run, but instead of turning back I decided on buying Vaseline at my first pit stop. You want to ensure yourself some funny looks; walk into the bathroom of a busy 7-11 with a container of Vaseline in your hand. Eyebrows will raise. I popped a couple of Advil to try to kill off the headache that was still squeezing my skull, drank some Gatorade, and topped off my hydration pack. Three and some odd miles down, and more to go. The next 3.5 miles were easy. 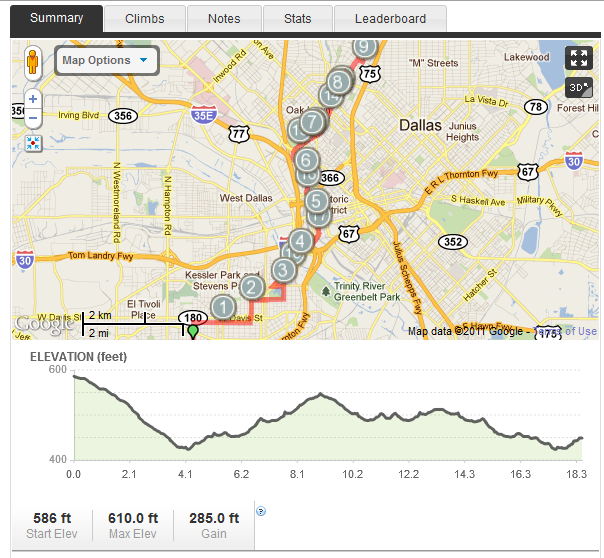 I ran over the bridge into downtown, and over to the trailhead of the Katy Trail. That’s when things started to go awry. My lovely RunMeter GPS froze up at mile four, TWO and a HALF miles behind me. Luckily I had this run mapped out the day before, so I knew exactly where to turn around and head back. Up the Katy Trail I went. Like a few of my friends, I will stop a run cold to pet a dog. I always find at least one that I need to say hello to, and speak to their pet parent. I met an ADORABLE golden lab puppy named Nixon. His mommy Amy was walking him on the trail, and he was just too adorable to not pet. He was 15 weeks old and just a little sweat heart. You could tell that he was going to be a BIG BOY. I chatted for a few minutes, scratched Nixon behind his ear and headed on my way. My next pit stop was packed with people. EVERYONE was in need of caffeine I suppose! I waited a few minutes for the restroom, and then had to take a minute to sit outside and make a shoe adjustment. I was wearing compression socks under my regular running socks, and it was starting to bug my right foot, so I removed the running sock from it. My left foot was having bouts of numbness and pain right below my big toe, so I adjusted the padding under the shoe tongue, and shifted the laces. It was then that I swapped out my gel flasks. I was wearing a holster on my backpack, and the first flask was about empty. BTW – orange flavored Roctane is NASTY when it gets warm. Blech! I made my final check of things and made my way back down the trail. Okay this is not so bad. I’m okay. Then at about a quarter to half mile from the trail head, I noticed that my gel flask fell off somewhere behind me. CRAP! Without gel I would be in risk of bonking, and on a run of this magnitude, it could prove to be a HUGE disaster. I turned around and headed back up the trail. I jogged and walked fast. I was scanning the trail back and forth, looking for my little flask. I also was trying to figure out in my head just how many miles I was packing on this run, by having to backtrack. I was a little panicked. I started to feel a little like I was in a tunnel. I just tried to stay focused. The only good thing that my RunMeter app was doing was verbally reading to me my Facebook comments. The encouraging words were being spoken to me, and it helped to keep my chin up. At two miles back up, I surrendered to the fact that the flask was no where to be found. I changed my game plan a bit and figured on stopping by either the downtown 7-11 or CVS for some kind of snack that I could carry with me and munch on, to battle hitting the wall. I checked my RunMeter app, and yeah still massively failing at tracking my miles. I started up a second app, iMapMyRun, which showed to have a strong GPS signal. At least I would know what my actual distance was on the backtrack. When I reached the trail head, I then remembered that I packed some Gu Chomps in my backpack, just in case. YES! I grabbed them out of the backpack and with the help of a Ziplock bag I had on hand, I attached it to my chest strap, and clipped my drinking tube to it for safe measure. Crisis averted, but I still wanted to make a quick pit stop for Gatorade and an on the go snack. I checked my iMapMyRun app, and well it failed me. I guess the trees on the Katy Trail were too much for the signal. No matter, I knew at what point I stopped, so I made a mental note. I figured that the entire up and back and up and back had me at almost 13 miles. My usual first pit stop was about 4 miles away, and from there I could either walk the remaining three miles home, or hop a bus. I ran over to CVS, about a mile away, and went in. I grabbed a big Gatorade, a Clif Bar, and gummy worms. There was nothing else there that would be a quick shot of sugar. As I got to the counter, I reached to undo my backpack to get my cash. It was then that I realized that my Gu Chomps were no longer on my strap. ARE YOU KIDDING ME WITH THIS???? I ran outside to see if they were on the sidewalk, but no luck. Damn. I continued on, running through downtown. RunMeter kept announcing the incorrect mileage, and I found myself talking back to it. My words were not very nice either. I ran on the shadiest sides of the streets that I could find. The sun was beating down, and the temps were taking off. I had to keep from getting over heated. As I ran up the Jefferson Viaduct, there was NO hiding from the sun; it bared it’s blazing fangs into me, and was beating the hell out of me. I kept drinking, sucking down Gatorade at a fast rate. I was starting to lose strength, so I started walking fast. I gentleman walked past me and stated the obvious, “Sure is a hot one today!” REALLY??? I tried to run a bit but my legs started to feel like lead. I just kept picking up my feet. My 7-11 was only a block away. Not far to go now! I made it to the door, and stopped RunMeter. I knew at that point I would not be able to even walk the rest of the way home. It was too hot, and my tank was almost on empty. I went inside and bought myself a well deserved Slurpee. I made a quick call to my boys (next door neighbors) and asked if they would not mind picking me up. They know all about my running, and had already said that if I ever got myself stranded, to call them and they would come get me. 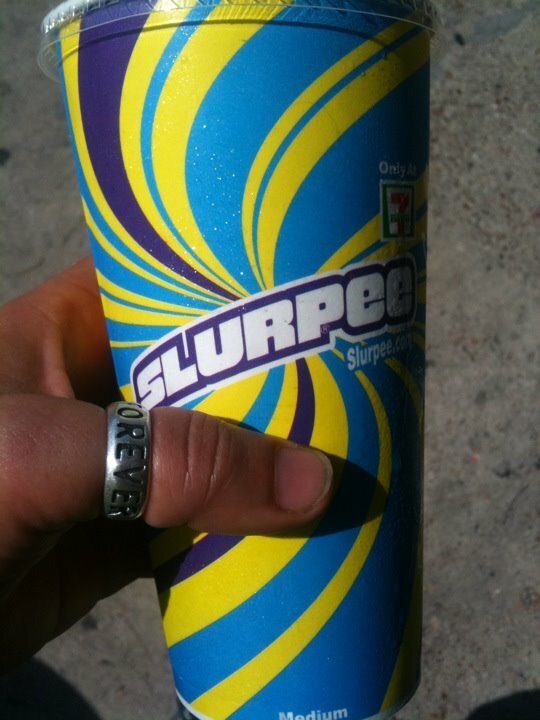 I sat outside in the smallest triangle of shade that was left on a sitting wall, and drank my Slurpee. My run was done, and so was I. I knew that I had at least made my minimum required mileage, but as to how much more, I would have to wait and see once I got home and looked at my mapping tools. I was really curious to find out just how far I went! After redrawing the route, and figuring out where I stopped and turned around on the Katy Trail, the total mileage came out to 18.42 miles! Overshot indeed! Yes the run had it’s crappy-assed moments, but I still came out on the winning side of it. This entry was posted in Running the Rock and tagged Advil, Asphalt, Clif Bar, dallas, fitness, Gatorade, Global Positioning System, heat wave 2011, Houston Street, Katy Trail, mapmyrun, marathon, marathon training, Mile, pets, Recreation and Sports, running, Slurpee, update, white rock marathon by Raven. Bookmark the permalink.